This garlic pork loin is my take on the famous and tasty Portuguese dish “Carne de Porco em Vinha D’Alhos” or “Vindalho”. It’s seasoned and roasted to perfection! Today is Friday! Yay!!!!!!! 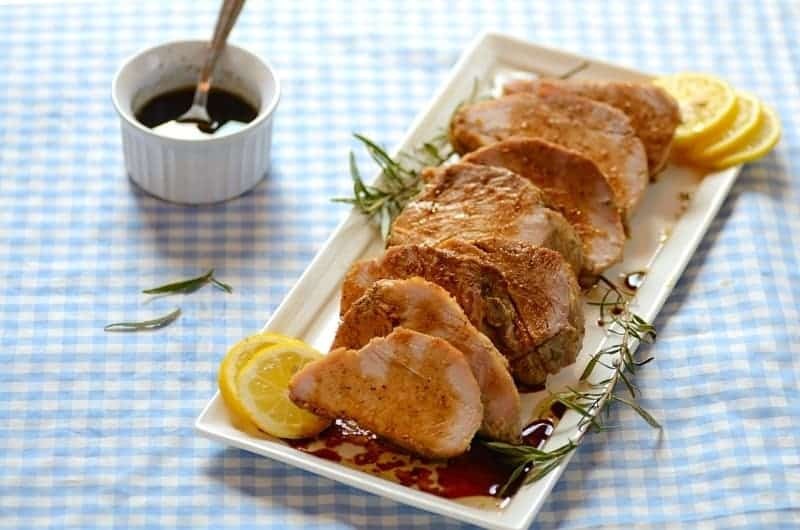 In my opinion, it is like a day of celebration that announces the best is yet to come: the weekend, of course…and my Garlic Pork Loin with Wine Sauce! Food has a starring role in all of this. 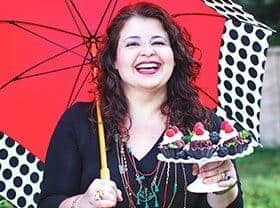 So I decided to share with you not just one but two Brazilian recipes for the weekend. Do you remember my last post about Collard Greens à la Mineira? I mentioned that I’d be serving this Garlic Roasted Pork Loin with both the greens and Cheesy Mashed Cassava with Coconut Milk and Cilantro.? Let’s go to the kitchen then. Preheat oven to 400° F (about 200º C). Follow the instructions on how to string a pork loin here. In a blender or food processor, process the oil, garlic, bouillon, salt, pepper, and rosemary. Place pork loin, fat side up, on a rack set over a roasting pan. Spread garlic paste all over pork loin. Roast in oven until a meat thermometer inserted into center of pork loin registers 155°F., about 55 minutes. Remove from oven, transfer loin to a platter, and discard string. Keep it warm while making the wine sauce. Slice loin just before serving. For the wine sauce, pour white wine into the roasting pan in which the loin was cooked. Place pan over medium heat, and scrape up browned bits from its bottom. Add stock, salt, and pepper; then, bring to a simmer. Cook, stirring, until liquid has reduced to half. Skim fat from surface of the liquid. Strain sauce and serve hot with sliced garlic pork loin. Garnish with rosemary sprigs and sliced lemon, if desired. It’s a modern take on Carne de Porco em vinha D’alhos or Vindalho! This garlic pork loin is my take on the famous and tasty Portuguese dish “Carne de Porco em Vinha D’Alhos. It's seasoned and roasted to perfection! Prepare the pork loin. Preheat oven to 400° F (about 200º C). 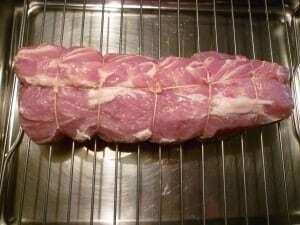 Tie pork loin with a cooking string. Or Follow the instructions on how to string a pork loin here. In a blender or food processor, process the first 6 ingredients. 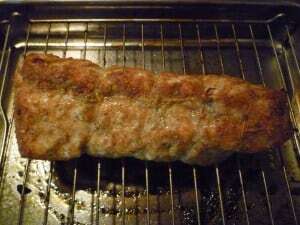 Place pork loin, fat side up, on a rack set over a roasting pan. 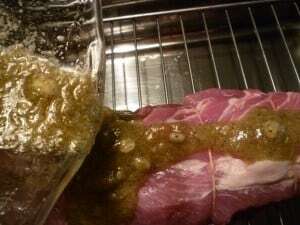 Spread garlic paste all over pork loin. Remove from oven, transfer loin to a platter, and discard string. Keep it warm while making the wine sauce. Slice loin just before serving. Prepare the wine sauce. Pour white wine into the roasting pan in which the loin was cooked. Place pan over medium heat, and scrape up browned bits from its bottom. 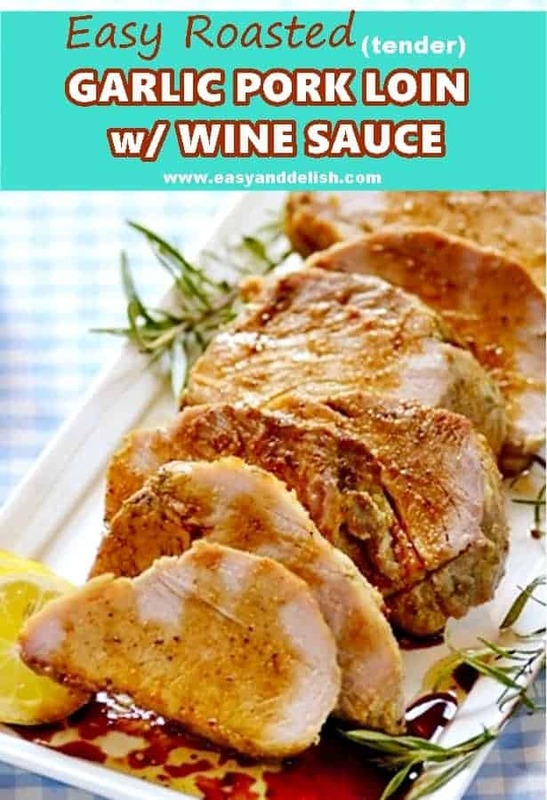 Strain sauce and serve hot with sliced pork loin. Garnish with rosemary sprigs and sliced lemon, if desired. Any leftovers must be refrigerated for up to 3 days. 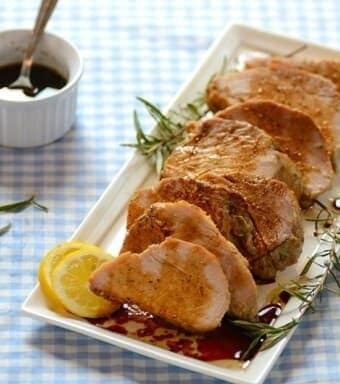 I love pork loin…this looks so good! Do I need a special kind of pan to cook it in, or can I just use a pyrex? You can use a pyrex. Just make sure that it’s made of tempered glass (it means that can go to the oven without shattering). But you have to know that it will take longer to cook. I advice you to lay down aluminum foil on the bottom of the pyrex for easier cleanup (no stuck on grease that is hard to clean off). I roasted mine in an aluminum baking pan. Anyway, as soon as it reaches 155 F, please remove the loin from oven.